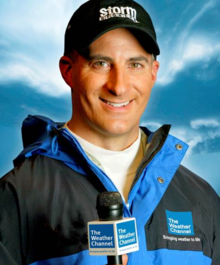 Cantore, a meteorologist and on-air personality for The Weather Channel, is a famous figure in hurricane reporting and is well-known for being in the middle of the worst weather. But on April 27, South Georgia residents have nothing to fear from Cantore. Instead of reporting from the eye of a hurricane he’ll be the keynote speaker at the Conference Discipleship Teams’ “Witnessing Through The Storm” event. “Witnessing Through The Storm,” set for Saturday, April 27 at Cordele First United Methodist Church, will be a day of exploring the many ways individuals and churches can be prepared in the event of a natural disaster and “be the church” in their communities and throughout the world. An all-day event, it begins at 10 a.m. and ends at 4 p.m. In addition to Cantore, the day’s other special guests include Cathy Earl, UMCOR’s Director of Disaster Response and U.S. Partner Relations, and Jenny Phillips, Global Ministries’ Creation Care/Sustainable Development Program Manager. The Conference Disaster Response Team will be collecting UMCOR hygiene kits and school kits the day of the event. Click here for information and instructions on assembling these kits. Connecting Neighbors: This overview of the UMCOR curriculum will explore the dynamics of disaster response ministry and practical tools for individuals and churches to be prepared before and event and what the road to recovery looks like for communities. The full curriculum can be used in your local church. Led by Allison Lindsey. UMCOR 101: Have you ever asked the question, "Where is UMCOR?". Come learn about the work of UMCOR and the unique way The UMC equips and empowers churches and individuals to be the hands and feet of Christ in disaster response ministry. Led by Cathy Earl, UMCOR. ERT 200: Site Assessment (Prerequisite current ERT badge) This advanced ERT training class will equip ERT members to evaluate and assess response and recovery needs in areas impacted by a disaster. Led by Luis Morales. Creation Care in the Church and the Community: Discover practical ways individuals and churches can strengthen initiatives and be equipped in addressing modes of living and working that impact climate change and environmental degradation. Learn about Earthkeepers and programs Global Ministries has in place to be good stewards of our environment. : Jenny Phillips. Global Ministries. Churches in Action: Panel Discussion: South Georgia has experienced a number of devastating severe weather over the past several years and we have seen churches respond in incredible ways. This panel discussion of clergy will share their experience which will raise awareness and inspire you as to ways that your ministries can be "boots on the ground" in your community following a disaster. Sheltering: Warming Shelters: Our homeless neighbors can be our most vulnerable during catastrophic events as they are unable to evacuate or during extreme temperatures such as freezing weather in winter months. Come learn how your church can be in ministry as a temporary refuge. Led by Wright Culpepper, Brunswick FUMC. Connecting Neighbors: The Church in Ministry: Disaster Response and Recovery can only be successful with partnerships established in communities and with organizations that focus on this unique type of ministry. This breakout will explore these partnerships, resources and assist churches in finding their "niche" in their community to be a presence in the event of a disaster. Led by Luis Morales. ERT 200: Team Leader Training: (Prerequisite current ERT badge) This advanced ERT training class will equip ERT members to serve as a team leader and deploy a team into areas impacted by a disaster. Led by Chris Hughes, Central UMC Fitzgerald. Creation Care: Discover practical ways individuals and churches can strengthen initiatives and be equipped in addressing modes of living and working that impact climate change and environmental degradation. Learn about Earthkeepers and programs Global Ministries has in place to be good stewards of our environment. Presenter: Jenny Phillips. Global Ministries. Clergy & Laity in Action: Panel Discussion In the aftermath of destructive weather over the past several years, laity have become an instrumental part in responding in their communities and beyond in incredible ways. This panel discussion of laity will share their experience and inspire you to use your passion and abilities in your community following a disaster. Sheltering: Good Samaritan Shelters Along with the threat of severe weather comes the plight of evacuees leaving their homes for safety. Several churches in South Georgia have opened their doors to be in ministry during this time of uncertainty for those needing lodging. This workshop will explore the pros/cons, reality and help church leadership think through the process. The key is to have a plan in place long before the evacuations are mandated. Led by Jamie Bone, Park Avenue UMC.